From the centrally located cord to the nerve roots that branch from it, your spinal column is resplendent with highly sensitive nervous tissue. This tissue is tasked with relaying messages about sensation and movement to your brain, and, as a key player in all aspects of your health, is housed entirely within the spinal column. When things are working as they should, the structure of the spinal column allows for unimpeded passage of the spinal cord, which descends down the center of the column, and the nerve roots which, having branched off from the cord, exit out the sides of the spinal column through holes called foramina. But age and/or injury related spinal changes can alter the topology of the structures that make up the spinal column. In particular, new bone may get laid down in response to arthritic processes. Another thing that can occur is a disc herniation injury. Whether we're talking about extruding herniated disc material or a bone spur, these tissues are not supposed to be there. Once they arrive, they may "encroach" on the spaces normally allotted for nerves. Encroaching generally results in some type of contact between the nerve or cord and the new bone or other tissue that has recently entered the area. And that contact, which tends to be irritating to the nerve, may produce pain or other symptoms. Quite often, the pain can be managed with conservative care; in other words, physical therapy, medication and possibly an injection may be enough to return you to your former quality of life. But for some, the pain persists to the point where surgery is done. And post-surgery, a small percentage of back surgery patients still have pain. If one or more back surgeries has failed to relieve your pain, you may be relegated to pain management. Spinal cord stimulation introduces electrical pulses to the affected nerves; this is done to prevent pain signals from being delivered to the brain, thereby masking sensations. The first step is usually to do a trial. During the trial surgery, as well as the permanent one, if that's the route you decide to go, the surgeon inserts a lead (insulated wire) either via a needle or an incision into your skin. At the end of the lead is an electrode that produces the electrical pulses. At this point in the procedure, you'll give your doctor feedback about the placement of the electrode. This, of course, is based on where you get the best pain relief. 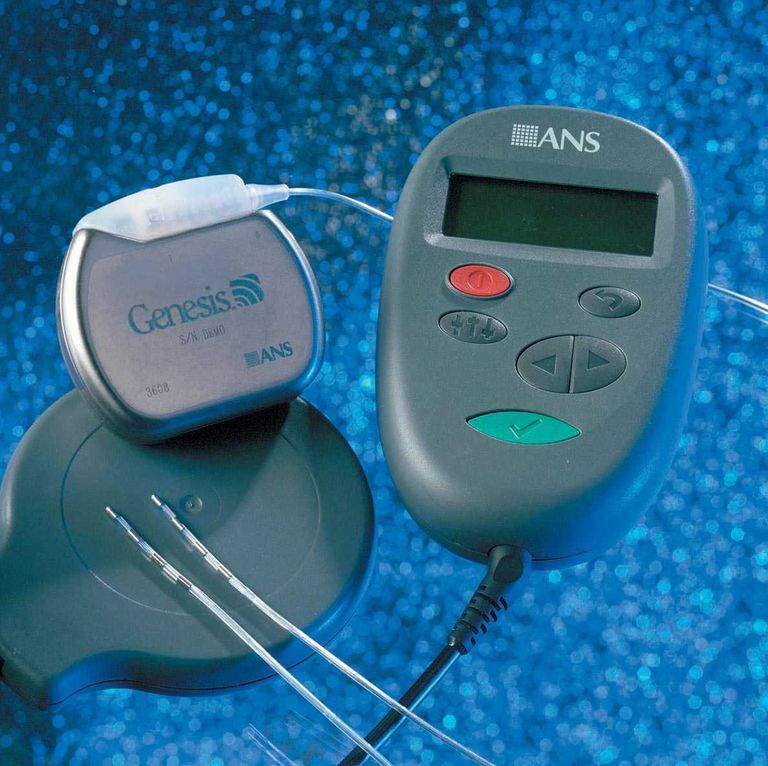 The device itself will not be implanted for the trial, which lasts a week. Instead, you'll wear the device externally, likely on your belt. During that week, you get a chance to determine if the therapy is right for you. If, after that 7-day period, the relief you get from the trial is acceptable to you, you and your doctor may then decide to go ahead with a permanent implantation. Along with the leads/electrodes, spinal cord stimulation devices are implanted in the permanent procedure, either in your buttocks or your abdomen. You'll be able to control the "volume" so to speak, by means of an external device that functions a bit like an antenna for the electrical pulses. Risks associated with implanted spinal cord stimulators include infection, scar tissue, equipment failure and/or breakage, spinal fluid leak, and other things. It's always good to be aware of the potential dangers, even if the risk is small, so before consenting, be sure to ask your doctor to fully explain what may go wrong with this procedure. When it comes to the risk for infection, which is a major concern for people planning a back surgery, the good news is it's actually low, at 2 to 3 percent, according to a 2017 study published in the journal Neuromodulation. Does Spinal Cord Stimulation Really Relieve Back Pain? As to how well this treatment works, a 2017 study published in the journal Spine suggests that as a pain management therapy, spinal cord stimulation is both beneficial and cost-effective, especially when it is compared to repeat surgery. Another study, this one a 20-year review of studies published in 2004 the Journal of Neurosurgery, found spinal cord stimulation to be successful in 62% of failed back surgery patients.